Portsmouth Crime Line has a three part approach to solving crime in our community. We take your anonymous tips, we send them to Portsmouth police Department for investigation, and we pay out a cash reward if a tip leads to arrest, recovery of stolen property, or seizure of illegal drugs. Portsmouth Crime Line relies on cooperation among community partners: Portsmouth Police Department, local news media, and its community members, to provide a flow of information about criminal activity and in an effort to stop crime. Anyone with knowledge of a crime can submit tips by calling the 1-888-LOCK-U-UPsm tip line, by using the P3 Tips mobile app or via the web. Tipsters are NEVER asked for their names or phone numbers, and they NEVER required to testify in court. When a tip is received, a tipster number is automatically generated and assigned to that specific tip. The tipster number is the only form of identification a tipster will need for any further communication with Crime Line, if and when the tipster is eligible for a cash reward. If information provided results in arrest, apprehension of a fugitive, recovery of stolen property or seizure of illegal drugs, a cash reward ranging from $100 to $1000, is paid to the tipster. Calls are received through the 1-888-LOCK-U-UPsm tip line, a stand-alone instrument, which does not provide caller ID and can make no outgoing calls. At no time are conversations on the crime tip line recorded. Crime Line call takers receive tip information and give the caller their randomly generated tip ID number and password. The tip is then passed through the police liaison to an investigating officer, who evaluates the tip and returns a disposition once investigation has concluded. By guaranteeing a caller's anonymity, Crime Line allows callers to give crime information in a positive atmosphere without fear of retaliation. And by offering cash rewards for information leading to an arrest, Crime Line encourages even reluctant callers to provide information. Tipsters now have an option of submitting tips to our program online. The process is completely secure and anonymous and is a very effective and efficient means of safely communicating with us in today's world. Our web tip process is powered by the world's leading online tip solution provider, Anderson Software. The very unique integrated Two-Way Dialog capabilities allow tipsters to come back and provide additional information to their tip at any time, but also provides a secure means for a call taker or assigned investigator to ask additional questions while you continue to remain anonymous. It also allows for reward information to be communicated to a tipster through a secure and encrypted interface. A randomly generated tip ID number and password will be assigned to each tipster, who should write it down for referencing their tip at any time. Tipsters may also download the app P3 Tips, to their smartphone or other smart device through Google Play and APP stores. This highly integrated and easy to use app, gives tipsters the ability to send their tip without ever speaking to a call taker. The app allows tipsters to upload photographs or video they feel would be beneficial to an investigator, all while remaining anonymous. It is important to point out that all tipsters who call in their tips through 1-888-LOCK-U-UPsm telephone line have the ability to continue their conversation with Crime Line through the app or the web simply by signing in with their ID number and password given to them by the call taker. You can even get tip disposition and reward information from the app or on the web. 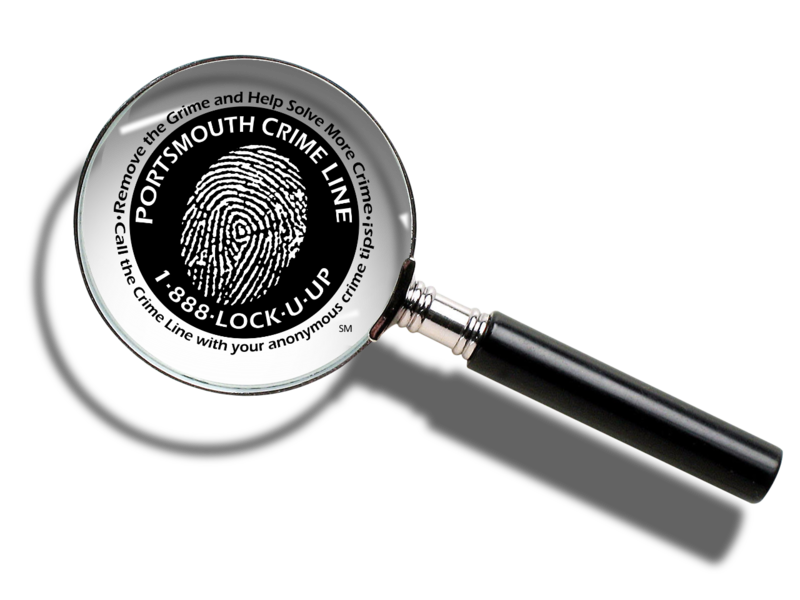 Once Portsmouth Crime Line receives a tip, it is sent to the Portsmouth Police liaison, who coordinates distribution of information to an Officer or Detective. After the tip is utilized, the investigator will determine if tip information is credible enough to aid in developing probable cause necessary to identify a suspect and obtain warrants or indictments. If tip information assists Portsmouth Police Department with identifying or arresting a suspect, recovering stolen property, or seizing illegal drugs, the tipster may be eligible for a cash reward. The disposition of a case is sent back to Portsmouth Police Liaison, who then presents findings to Portsmouth Crime Line Board of Directors for review. The all civilian volunteer board will then decide a value for information based on suspect arrest charges, value of recovered stolen property or value of seized illegal drugs. Reward information along with instructions on picking up any cash reward is sent to a tipster through P3 Tips program. Tipsters may claim their reward without having to identify themselves, show identification, make a statement, or testify in court. It's that simple.